It’s been said it’s not how you start but how you finish. It was last Sunday, October 9th at about 11:30am when I began loading my truck to head to Short Hills, New Jersey. 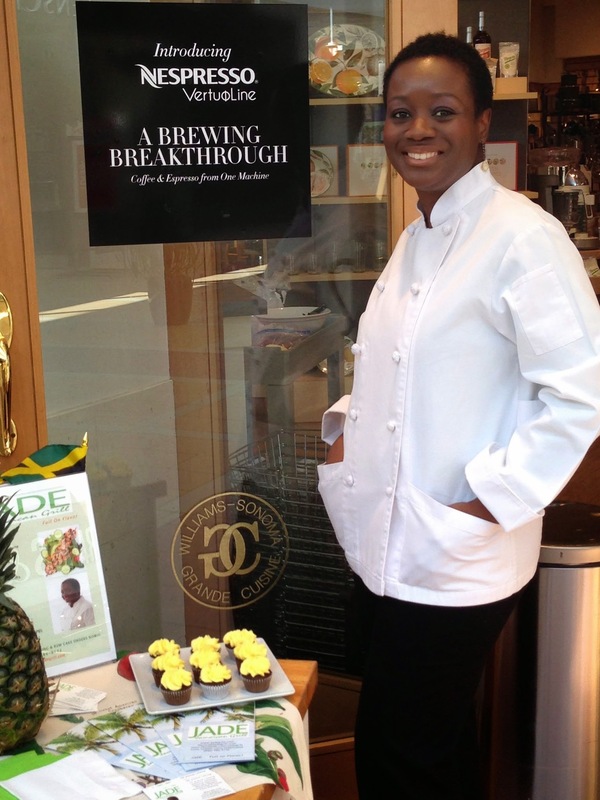 I was on my way to Williams-Sonoma to teach a cooking demonstration. The rain fell steadily as my son Robert and I packed up to leave. It wasn’t long before we were on our way. As we entered the New Jersey Turnpike, the rain began to pour. It did so the entire ride. Right up until the moment we exited the highway. What was a continuous shower for over an hour, subsided into a light mist. The parking lots around the mall were fuller than expected. We entered Williams-Sonoma to tens of busy shoppers. I began staging the countertop near the stove. My theme was Falsetto Cooking Demo: Fall Flavors that Make Your Mouth Sing. 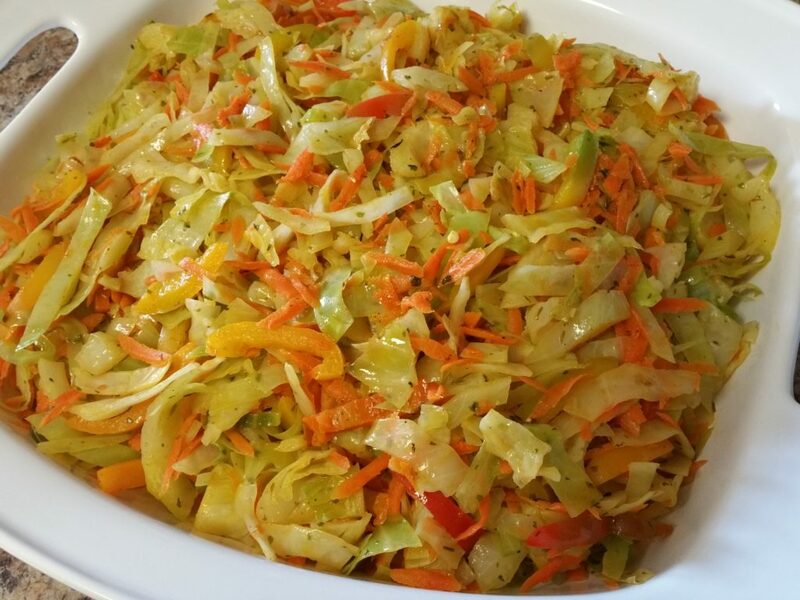 The menu featured Cabbage Confetti, a flavorful dish made with green cabbage, carrots, bell peppers, fresh thyme, a few spices, oil and water. Also on the menu was Sesame Chicken, an easy-to-make savory, Asian-style dish. I also brought along a couple dozen of my Rum Cupcakes. I hardly ever leave home without them. The ingredients were laid out, so too were serving platters, pots and pans, and everything necessary for a successful demo event. The class got underway with much chopping, slicing, shredding and seasoning. As the flame kicked underneath the frying pans, the fragrant flavor of freshly prepared food found its way out and into the mall. Within a few toss of the cabbage the demo area was littered with onlookers. I cooked and served cabbage, chicken and cupcakes to an uber-satisfied crowd. A dreary and damp day had turned sunny side up. We walked out of Williams-Sonoma and into a blindingly bright Sunday afternoon. It was a remarkable day from start to finish. For recipes, entertaining ideas and more, visit www.jadegrill.com or email flavors@jadegrill.com. As I sat at my desk outlining my fall calendar a few weeks ago it occurred to me how fortunate I am to be working with Williams-Sonoma. With two upcoming food events at the gourmet retailer, I began to reflect on how our collaboration began. So, I thought I’d take the opportunity to share how it all came to be. Our relationship is no accident. I had taught cooking classes at another chain store. After about three years, I decided to fold it into my own product offering as Pantry Parties – private, hands-on instruction in the comfort of the client’s home. So, I’d been there, done that so to speak. Seeking to establish my brand as a flavorful food venture- not merely a Jamaican one, I set my sights on a company whose name is synonymous with taste, quality, style and functionality. If you’re a food connoisseur, Williams-Sonoma’s high quality cookware, specialty products, gourmet foods, in-store culinary events and stylish home furnishings are familiar. And it’s not just passionate foodies; professional chefs are hot for the brand. Not long after I formed my namesake JADE in the fall of 2013, I contacted the Princeton, New Jersey store to see whether they offered cooking classes and how I would go about getting on the roster. During our conversation I fired off my list of accomplishments – numerous television appearances on NBC and FOX, a cooking series on PBS, mentions in the local print press, having taught culinary demonstrations previously, and so on. They were impressed and we scheduled a meeting and site tour. I followed-up with an email, included the standard accompaniments – my resume, bio, head shot and media clippings. We met, all went well and we booked my first cooking class. Thrilled about my score I wasted no time. I telephoned the flagship store at Columbus Circle in New York City. A similar scenario transpired. After a site tour the assistant manager and I discussed how we would incorporate my brand of flavor into the mix. Long story short, we settled on a date for demo number two. My first demonstration was a success. So much so that by the time I reached out to the King of Prussia store the following Monday they were well aware of who I was and equally as excited about me doing a demo there. Since then I’ve taught almost ten classes, in five cities and three states in under two years. I’ve loved every minute of it! And from the fact that they’ve invited me back numerous times – I think it’s safe to say they relish having me there too. And that’s how the story goes!